Today’s working life environment is global and characterised by multicultural and multidisciplinary teamwork in global networks. This sets demands on the employees who need new kinds of skills and competencies to be able do their work effectively. Since the main task of the universities of applied sciences (UAS) is to educate and prepare their students for the future working life, it would be crucial to be able to predict what skills and competencies the graduates will need. Due to the challenges brought about by globalisation, especially international skills and cultural knowledge have become essential in any work. The objective of the present article is to discuss the skills and competencies needed in the working life environment the UAS graduates will face after graduation. This article also discusses how employers regard international skills and knowledge when recruiting new employees. In addition, the article describes how the goals set for internationalisation in the Finnish higher education are reached and with what kind of methods. Furthermore, possibilities to develop the students’ intercultural communication competence during the studies are discussed. Because of the fast internationalisation of the working life in Finland, the importance of intercultural knowledge and versatile communication and language skills will grow at workplaces in the future. The ethnic, linguistic and cultural diversity will increase, and as a result, cultural tolerance will be more and more demanded. (Sajavaara & Salo 2007.) The future workplaces will be global and multicultural. As a result, profound knowledge of working with people from different cultures is a prerequisite to succeed in the future working environment. 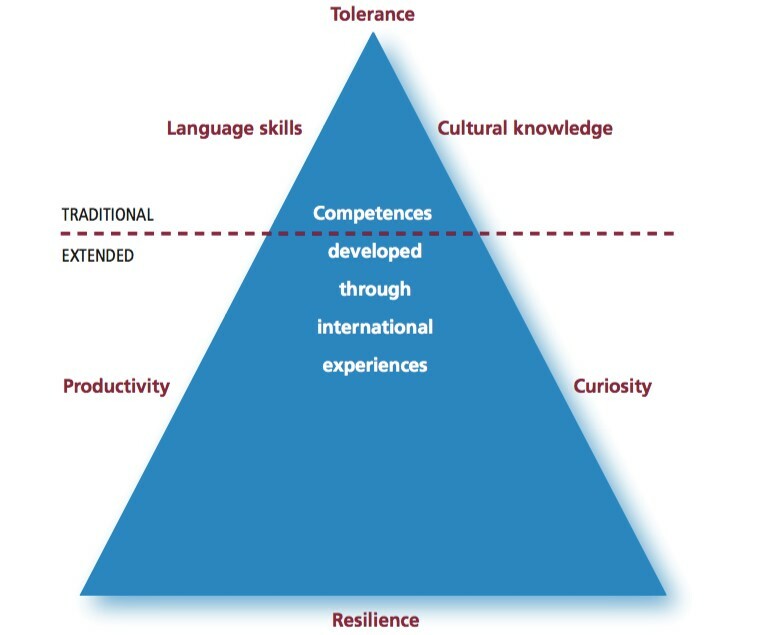 In the extended understanding of international competence, language and communications skills are seen as the basis for international networking and development of expertise. Versatile communication skills are needed in the global working life when working in multicultural and multidisciplinary teams and networks. (Jalkanen, Almonkari & Taalas, 2016.) Language and communication studies play a central role when training internationally competent professionals at universities of applied sciences. Even if the number of students going on a student exchange has increased in the 21st century in higher education, all students are not willing to study or do their work placement abroad. Therefore, in addition to student mobility, internationalisation should be integrated in the studies at the students’ home university in Finland. The term intercultural communication competence (ICC) is used when referring to the abilities and skills needed in interaction with people from different cultures. ICC is regarded as a precondition for successful intercultural interaction and encounters which involve meeting and communicating with persons representing another cultural background. ICC comprises components such as motivation, attitudes and emotions, knowledge, and behavior and skills. Motivation refers to the desire to communicate appropriately and effectively, knowledge means the awareness needed in intercultural situations, and skills are the abilities necessary for intercultural communication. (Gudykunst 2004, Korhonen 2002, Spenser-Oatey & Franklin 2009.) All these elements should also be part of intercultural communication training and teaching. Internationalisation at institutes of higher education is mostly concentrated on student and teacher mobility even if most students and teachers do not participate in it. Thus, internationalisation at home should be made possible for all students. For example, the students could be provided with studies and training in intercultural communication skills to develop their intercultural competence. Intercultural communication studies are one way to implement internationalisation at home for students who do not participate in international mobility. These studies, on the other hand, also prepare the outgoing students to benefit better from their international mobility period. Intercultural communication studies were arranged from 2003 until 2016 as a free-choice elective course especially for the exchange students coming to Rovaniemi UAS and later to Lapland UAS. The course was developed during these years, for example, based on the student feedback and the demands set in the curricula reforms. After the curricula reform in 2008, the course comprised 5 credits and was titled Intercultural Communication in Finland. The objectives and topics covered on this course are presented in Table 1 below. The students were given a chance to learn and discuss the features of their own culture based on the theories of culture and to reflect their own culturally determined values, behaviour and ways of thinking. The course assignments included giving a culture presentation about the participant’s own culture. In this presentation the students were asked to discuss the following questions. What are the most important things that are necessary for foreigners to know about your culture so that they would understand you better? What is typical / unique of your culture? How do people communicate in your culture? Consider both verbal and nonverbal communication. Consider various aspects in your culture that should be considered in everyday life. Give examples. On this course a special emphasis was placed on the Finnish culture and communication. The Finnish traditions, customs and phenomena were studied both in theory and in a real-life context. The students reflected their observations and experiences of the Finnish culture and the Finnish people and shared them with the other course participants by writing a blog throughout the course. In addition, visits and joint cultural events were organised by groups of Finnish students as part of their English language courses. These events dealt with topics such as Finnish Christmas, Finnish sports and Finnish nature. The events were hands-on situations the purpose of which was to learn about the Finnish culture through joint activities with Finnish students. From the very beginning the course Intercultural Communication in Finland was very popular among the international students. The students discussed and reflected their learning experience and gave feedback in the reflective essays that they wrote during the course. The teachers also collected course feedback to develop the course. The quotes presented below are from the course participants’ assignments and the feedback gathered during the course. The students clearly felt the need to develop their intercultural skills and competence. In particular, the students appreciated the skills and knowledge they gained during the course, and the fact that they can utilise them in their future profession. The students learnt to recognise features of their own culture and other cultures. I have enjoyed this course because it gave me an opportunity to deepen my knowledge of cultures and to understand something about my own culture and country, and how others see it. According to the feedback, the students really appreciated the opportunity to study in a multicultural group. The course helped them to adapt to the international student community and to understand the Finns and the Finnish communication style. I liked the course quite a lot because I really experienced a very international atmosphere in class. I think I learnt a lot of things during each lesson that are useful for my future and I know I wouldn’t have had this experience at my home university. I really enjoyed the course. I had a great opportunity to study different cultures and learn much about them. This made my life much easier here, when you consider how many new and different people we had to deal with every day. In the future I will try to use all the facts we learned during classes in practice. Polish style is different. For me it was discouraging [to talk to Finns] at the beginning because I thought the person I was talking to was not listening what I was saying. But now I am not surprised anymore as I get used to this type of conversation. In Finland, the silence is common, Finns prefer to keep silence than to say an empty word. Unlike the Americans who consider it as a negative quiet. Silence is expression of indecision or disagreement in the Czech Republic. Besides learning from different cultures in practice, the students also liked the course arrangements and the teaching methods as can be seen from the feedback. The discussions and sharing cultural experiences in class were considered a good learning method. The presentations of the different cultures were the part I liked best. It was so interesting to learn about the behavior and the culture from the native people’s point of view. The course contents were well structured and it was really easy to follow. I prefer to do different presentations and a reflective essay instead of writing an exam. The combination of groupwork and lectures was stimulating. During the great experience of intercultural communication in the class and with my classmates, I got a lot of knowledge about different cultures not only about Finland but the other European countries, but also about my own country’s culture. And it was a good opportunity to combine knowledge and practice. The students studying at universities of applied sciences are prepared for the skills and competencies required by working life. The importance of international competence will grow in the future as workplaces turn more and more multicultural. Intercultural knowledge and versatile communication and language skills are the basis of international competence. However, besides these traditional skills, a new set of skills should be added when describing the international competence. In addition, the learning outcomes gained during international mobility and through international experiences should be better defined and made visible. Since all students do not go abroad for a student exchange, possibilities for internationalisation at home should be increased and diversified. Moreover, the international exchanges should be defined clear objectives, and the students’ international experience should be reflected upon after the exchange. To reach the goals of internationalisation defined in the degree competencies, methods to develop the students’ intercultural communication competence should be included in the curriculum. A good practice is to arrange intercultural communication teaching as part of the studies. Students will benefit from intercultural communication studies in multicultural student groups in which they can gain, share and reflect cultural knowledge and experience, and, of course, obtain first-hand knowledge of each other’s cultures. The intercultural communication training provides the students an opportunity to develop as interculturally competent persons. Alatalo-Korpi, H. 2009. Millaisia insinöörejä tulevaisuudessa tarvitaan?–In Insinöörin uusi maailma (ed. J. Keskitalo), 13–16. Hämeen ammattikorkeakoulun julkaisuja. Ammattikorkeakoulujen rehtorineuvosto ARENE ry. 2010. Suositus tutkintojen kansallisen viitekehyksen (NQF) ja tutkintojen yhteisten kompetenssien soveltamisesta ammattikorkeakouluissa. Accessed 21 June 2017 http://www.arene.fi/sites/default/files/PDF/2015/NQF.pdf. Crowther, P., Joris, M., & Otten, M., Teekens, H. & Wächter, B. 2000. Internationalisation at Home: A Position Paper. Amsterdam: European Association for International Education. Accessed 21 June 2017 https://urly.fi/N8P. Demos Helsinki 2013. Piilotettu osaaminen. Helsinki:Demos Helsinki. Accessed 11 June 2017 https://urly.fi/N2L. EK 2011. Oivallus. Loppuraportti. Elinkeinoelämän keskusliitto. Accessed 12 June 2017 https://ek.fi/wp-content/uploads/Oivallus_loppuraportti.pdf. Finnish National Agency for Education 2017. Students heading abroad are flexible and understand different perpectives 2017. Results from the Global Mindedness survey. Facts Express 2B/2017. https://urly.fi/N7T. Fowler, S.M. & Blohm, J.M. 2004. An Analysis of Methods for Intercultural Training. In D. Landis, Bennett J.M. & Bennett, M. (ed.) Handbook for Intercultural Training. 3rd edition. Sage Publications, 37–84. Garam, I. 2012a. Internationality as part of higher education studies. Faktaa 1B/2012. Centre of International Mobility CIMO. Accessed 11 June 2017 https://urly.fi/N3Q. Garam, I. 2012b. Kansainvälisyys osana korkeakouluopintoja. Faktaa 1A/ 2012. Centre of International Mobility CIMO. Accessed 11 June 2017 https://urly.fi/N2I. Gore, K. 2007. Networking Cultural Knowledge. Helsinki: WSOY. Gudykunst, W. B. 2004. Bridging Differences: Effective Intergroup Communication. 4th edition. London: Sage. Hidden Competences 2014. Faktaa – Facts and Figures 1/2014. Centre of International Mobility CIMO. Accessed 11 June 2017 https://urly.fi/N2N. Jalkanen, J., Almonkari, M.& Taalas, P. 2016. Viestintä- ja kieliopintojen kehittäminen kansainvälistyvässä korkeakoulussa. Yliopistopedagogiikka 2016 Vol.23 Nro 1. Accessed 11 June 2017 https://urly.fi/N2K. A Training Experiment with Bachelor of Engineering Students. Jyväskylä Studies in Communication 17. University of Jyväskylä. Academic dissertation. Korkeakoulujen kansainvälistymisstrategia 2009–2015. Opetusministeriön julkaisuja 2009:21. Accessed 11 June 2017 https://urly.fi/N85. Lapland University of Applied Sciences 2017. Curriculum. SoleOPS. Accessed 20 June 2017 https://soleops.lapinamk.fi/opsnet/disp/fi/welcome/nop. Mielityinen , I. (ed.) 2009. Suomi tarvitsee maailman parasta insinööriosaamista. Tekniikan Akateemisten Liitto TEK. Accessed 12 June 2017 https://urly.fi/N3g. Sajavaara, A. & Salo, M. 2007. Työelämän kielitaitotarpeet ja kielikoulutus. In Pöyhönen & M. Luukka (ed.) Kohti tulevaisuuden kielikoulutusta. Koulutuspoliittisen projektin loppuraportti. Jyväskylä: Jyväskylän yliopistopaino, 233–248. Accessed 12 June 2017 https://urly.fi/N3c. Spenser-Oatey, H. & Franklin, P. 2009. Intercultural Interaction. A Multidisciplinary Approach to Intercultural Communication. Palgrave Macmillan UK.